:Sometimes, choosing to love your husband is hard. Whether you've been married one year or 31 years, chances are he's done things that have frustrated you, angered you, hurt you, or flabbergasted you. But after arguing over how to load the dishwasher yet again, you might be wondering how you can show him that you really do love him. In as little as 15 minutes a day, you can do something meaningful for your husband and grow in your faith. From washing his car to writing a positive post about him on social media to watching his favorite movie with him, these pages are full of creative, simple, and interactive ideas on how to bless your husband. You'll discover daily Scripture verses, inspirational readings, and journaling prompts to encourage you as well! 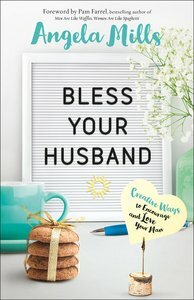 About "Bless Your Husband: Creative Ways to Encourage and Love Your Man"